This short documentary tells the story of the uprising in Bosnia and Herzegovina that started in early 2014. Since February 5, protests have swept across Bosnia and Herzegovina, started by workers from five factories in northern city of Tuzla: Dita, Polihem, Poliolhem, GUMARA and Konjuh. The factories had been privatized, bankrupted and stripped of assets, leaving the workers with large debts, no salaries, no health care and no benefits. 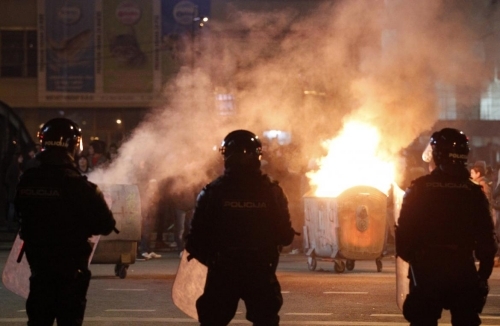 The protests culminated on February 7, 2014 when several governmental buildings were set on fire in cities across the country, including the presidential building in Sarajevo. Under pressure of protests, four regional governments resigned. The protests were followed with mass popular assemblies, referred to as plenums, that quickly spread across the country. We need a specifically political organization. This international organization must act as a political point of reference for the class in the general assemblies and committees of delegates that emerge when the class begins to find its strength. In the absence of such an organization, a vanguard within the class, these types of moments are in danger of cooption and derailment. One example is the danger of opening to interclassism, defining it as a BiH problem ('we are all Bosnians Herzegovians' from a different video on plenums; also note the prominence of the flag of BiH), having illusions in democracy or salvation from the EU. We need to draw out the lessons that every country is part of a global capitalist system, that our fight as wage slaves is everywhere the same, to pose the question of our class power with the goal in mind to abolish wage slavery, national frontiers and capitalist property relations.